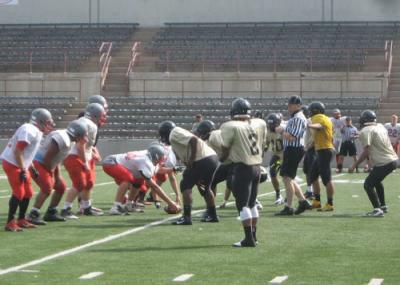 After a summer's worth of prepping and practicing, local teams are ready to hit the gridiron. ER NOTES – I stopped by the recent Central Tech-Ashtabula Edgewood scrimmage at Erie Veterans' stadium, and I couldn't help but be impressed with Falcon Coach Rob Matz, a definite no-nonsense guy. He is positively building a program the right way, CT a force to be reckoned with in the near future. Also, it was great watching the Falcons run a single-wing offense, an offense Matz has gone throughout the country studying. Put the Falcons down as one of the potential surprise teams of the season. There was no doubt who's in charge of this team, but the players were also enjoying themselves and seemed to be gaining confidence with every play. From the short time I was there, Central Tech unquestionably appeared to be the better squad. And football isn't the only program on the rise there; talking with CT Athletic Director Greg Holland was also impressive. He's extremely proud of the number of kids going out for other sports, including soccer, where "World Cup Fever" apparently struck the Cherry Street school, as 60 youngsters showed up for soccer practice. Holland also mentioned he will be handling the AD duties for East High School. He may be the busiest person in the Erie School District this year. SOMEONE ASKED me whether Strong Vincent star Jarred Carlson, who transferred to McDowell, moved to Millcreek or will attend as an out-of-district student. I didn't know the answer, but Carlson is a standout performer on both sides of the ball, who will be an immense help to first-year coach Brad Orlando. Ironically enough, Orlando made the same move when he became a Trojan for his senior season after starring at SV. And it was definitely a good move for him. THERE WILL BE a lot of eyes on the Cathedral Prep squad after Offensive Coordinator Orlando and Defensive Coordinator Matt Melle made the move to rival McDowell, Orlando as the head man and Melle as the DC. CP boss Mike Mischler will run the offense and highly-respected Mike Krahe takes over the D.
THE McDOWELL-PREP game is always the top attraction locally, and it's hard to imagine, but there will be even more interest (make that intensity) at the Stadium this season. Circle Friday, Sept. 12 on your grid calendar. I HAVE HAD a lot of time to think about the General McLane School District making its football team play in Quad-A for the post-season, the Lancers actually being a Triple-A team enrollment wise. At first, this struck me as a kind of a stupid idea, but since I have had time to give it some serious thought, I have concluded it really is one of the dumbest decisions ever made in local sports history. It's a decision that was made by some adults who have had their egos singed and decided to put their injured feelings ahead of what's correct for the actual athletes. With that being said, kudos to the GM School Board for reinstating boys basketball coach Brian Schulz to the head position. I was at the meeting, and it could not have been handled any better by everyone involved. ERIE LOST one of its best fans recently when Jimmy DeFazio passed away. Jimmy D. was a fixture at many, many sporting events following his retirement from the Erie School District, especially Gannon basketball games. He was best known as the groundskeeper at Erie veteran's stadium, pre-artificial turf. It was rumored he knew every blade of grass personally at the Stadium. Ironically, I knew him for 15 years before I realized we lived within two blocks of each other. I never saw him in the neighborhood because he was always at the Stadium. He was undeniably one of my favorite people of all-time. He and his brothers made the DeFazio name synonymous with Erie sports. My father said he was one of the best, so that was good enough for me. UPSET SPECIAL – Central Tech over Warren.